Cycling from Land’s End To John O’Groats is the ultimate challenge in British cycling – it’s one of the most gruelling feats of endurance in any sport – and yet each year it attracts many thousands of participants. Ordinary people who have been inspired to do something extraordinary – for charity, for the adventure, or to test themselves to the limit. Each cyclist will have their own individual story. Most take between 10 and 14 days to complete the 800+ mile journey. But what is possible? 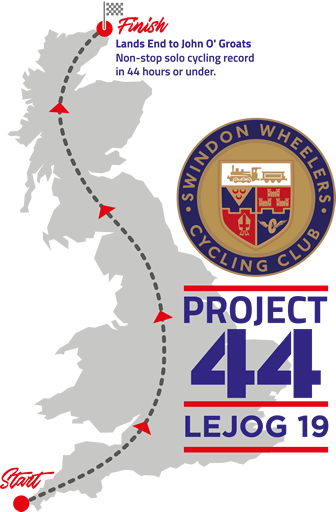 Ian To, an ultracyclist from Liddington in Wiltshire and member of Swindon Wheelers Cycling Club, is attempting to test the boundaries of possibility and break the record for the fastest bike ride ever across the length of Britain. Cycling non-stop, Ian will aim to ride the 840-mile distance in under 43 hours and 25 minutes. During this single ride, Ian will burn around 35,000 calories and will climb in total more than the height of Mount Everest! But it won’t stop there – if he is successful, Ian will then chase the national 1,000 mile record, a mark standing at an incredible 55 hours and 59 minutes.